The Order of Shaikh ‘Isa bin Salman al-Khalifa (Wisam al-Shaikh ‘Isa bin Salman Al Khalifa): founded by Amir ‘Isa II bin Salman al-Khalifa in 1976. Modified and enhanced by King Hamad II. Awarded in an exceptional class and five ordinary classes. 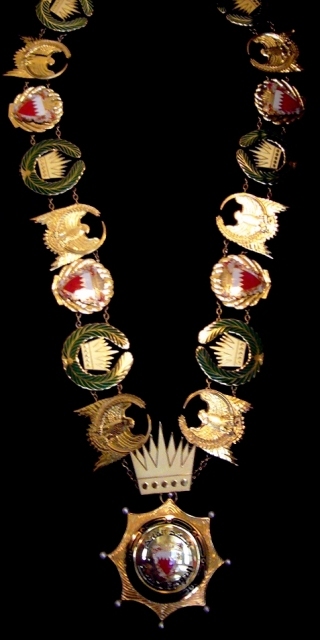 The Order of Khalifa - collar and collar badge. The Order of Al-Khalifa (Wissam al-Khalifa): founded by Shaikh Hamad bin ‘Isa al-Khalifa on 7th February 1940 in three classes (1. Star, 2. Decoration and 3. Medal). Revived and reorganised by Amir ‘Isa II bin Salman al-Khalifa in 1976 as a reward for exceptional services to the state. 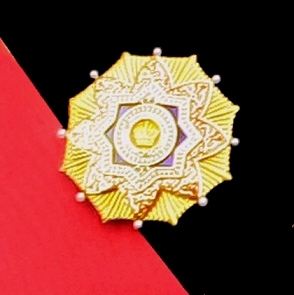 Thereafter awarded in an Exceptional Class (Qiladat al-Khalifa or the Al-Khalifa Collar – limited to Heads of State) and five ordinary classes. 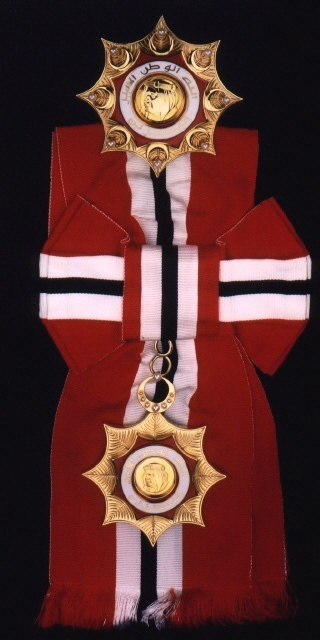 The King Hamad Order of the Renaissance - first class, sash and breast star. The King Hamad Order of the Renaissance (or for Development): founded by King Hamad II on 17th April 2008 to recognise services towards the development of the nation. Awarded in fives classes (1. First Class – awarded to foreign leaders, prime ministers, crown princes, parliamentary chiefs, ministers or those of equal rank. 2. Second Class – awarded to civil servants and military personnel involved in the country's development since 2001. 3. Third Class – awarded to those who have helped develop women's rights and human rights). The Order of Ahmad the Conqueror - first class, breast star. The Order of Military Courage. The Order of Military Courage: founded by Amir ‘Isa II bin Salman al-Khalifa in 1976 as a reward for military gallantry. Awarded in a single class. The Order of Bahrain - breast star, sash and sash badge. 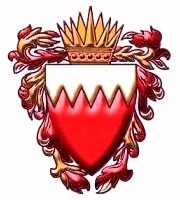 The Order of Bahrain (Wisam al-Bahrein): founded by Amir ‘Isa II bin Salman al-Khalifa in 1976 as a reward for meritorious services to the state of a military, diplomatic or civil character. Awarded in five classes. The Order of Achievement (or Competence) (Wisam al-Amajat): founded by Amir ‘Isa II in 1976. Awarded in three classes (1. First Class in gold, 2. Second Class in silver, and 3. Third Class in bronze). The Medal of Military Merit (Wissam al-Khidmat al-Askari): founded by Amir ‘Isa II in 1976 to recognise distinguished services in the military forces of Bahrain. Awarded in three classes (1. First Class in gold, 2. Second Class in silver, and 3. Third Class in bronze). The Medal of Military Duty (Wissam al-Wajib al-Askari): instituted by Amir ‘Isa II in 1991 to recognise distinguished services in the military forces of Bahrain. Awarded in three classes (1. First Class in gold, 2. Second Class in silver, and 3. Third Class in bronze). The Military Long Service Medal (L), the Medal for Military Duty (C) and the Kuwait Liberation Medal (R). The Kuwait Liberation Medal (Medalat al-Tahrir al-Kuwait): instituded by Amir ‘Isa II in 1991 to recognise the services of members of the Bahrain military forces in the liberation of Kuwait and the First Gulf War. Awarded in a single class, bronze medal. The Bravery Medal: instituted by Amir 'Isa II in 1976 to recognise bravery. Awarded in a single class. 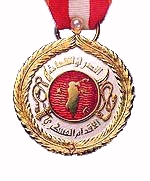 The Police Medal for Devotion to Duty: instituted by Amir 'Isa II to recognise distinguished services in the Police and Public Security services of Bahrain. Awarded in two classes. The Police Medals for Devotion to Duty, Distinguished Service, Meritorious Service, and Long Service. The Police Distinguished Service Medal: instituted by Amir ‘Isa II in 1976 to recognise bravery by members of the Police and Public Security services of Bahrain. The Police Meritorious Service Medal: instituted by Amir ‘Isa II in 1976 to recognise meritorious services in the Police and Public Security services of Bahrain. The Police Long Service Medal: instituted by Amir ‘Isa II in 1976 to recognise long service and good conduct in the Police and Public Security services of Bahrain. Awarded in three classes (1. First Class in silver-gilt, 2. Second Class in silver, and 3. Third Class in bronze). The King Hamad II 10th Anniversary of Accession Commemorative Medal: instituted 14th December 2009 by King Hamad to commemorate the tenth anniversary of his accession to the throne. Awarded in a single class).